This is a shield-shaped National Wildlife Refuge porcelain sign. 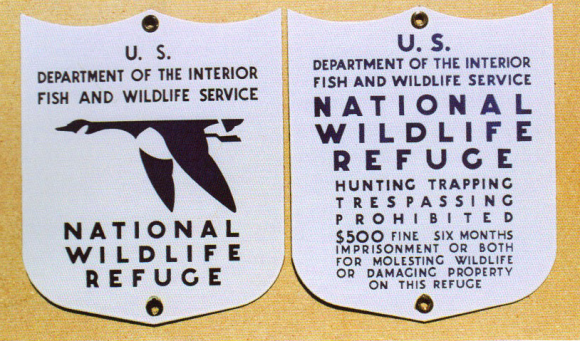 This particular National Wildlife Refuge sign is white with black print. It reads, “U.S. Department of The Interior Fish and Wildlife Service, National Wildlife Refuge, Hunting, Trapping, Trespassing Prohibited $500 Fine, Six Months Imprisonment or Both For Molesting Wildlife or Damaging Property On This Refuge” and features a flying bird in the center.